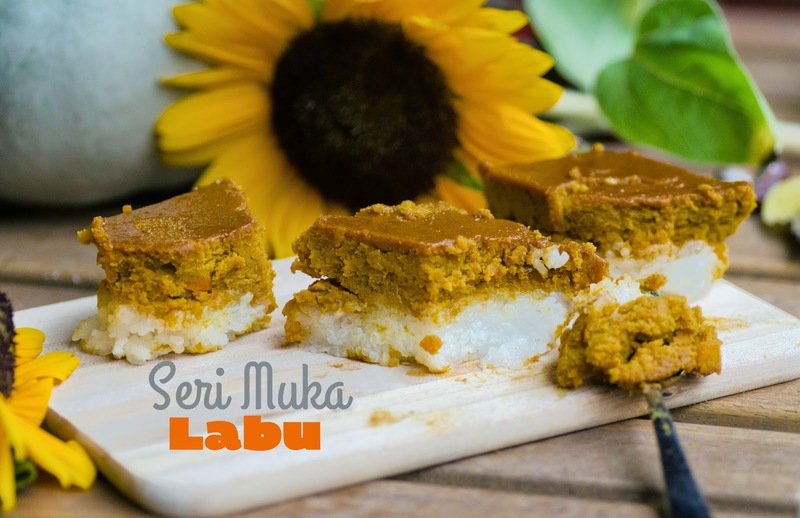 Few months ago I wrote a recipe of my favorite kuih - kuih seri muka . Well, weeks ago I made a fusion version of my favorite kuih using pumpkin custard as the top layer (labu = pumpkin). The combination of sticky rice with pumpkin tastes great, and I was surprised how it turns out to be. It's like enjoying both of my favorite Malaysian and American desserts in one bite (I love the American pumpkin pie!). 1. Cook the rice in the rice cooker until set. Fluff up the rice using a fork and put it in a 24 cm springform pan which has been oiled and press the rice until compact, set aside. 2. Combine all the ingredients for the custard in a food processor and processed the mixture. Pour the custard layer on top of the rice layer and bake in the 180 degrees Celsius for 40 minutes or until the custard layer becomes brownish. 3. Let the kuih cools to a room temperature, and cut it using oiled knife.